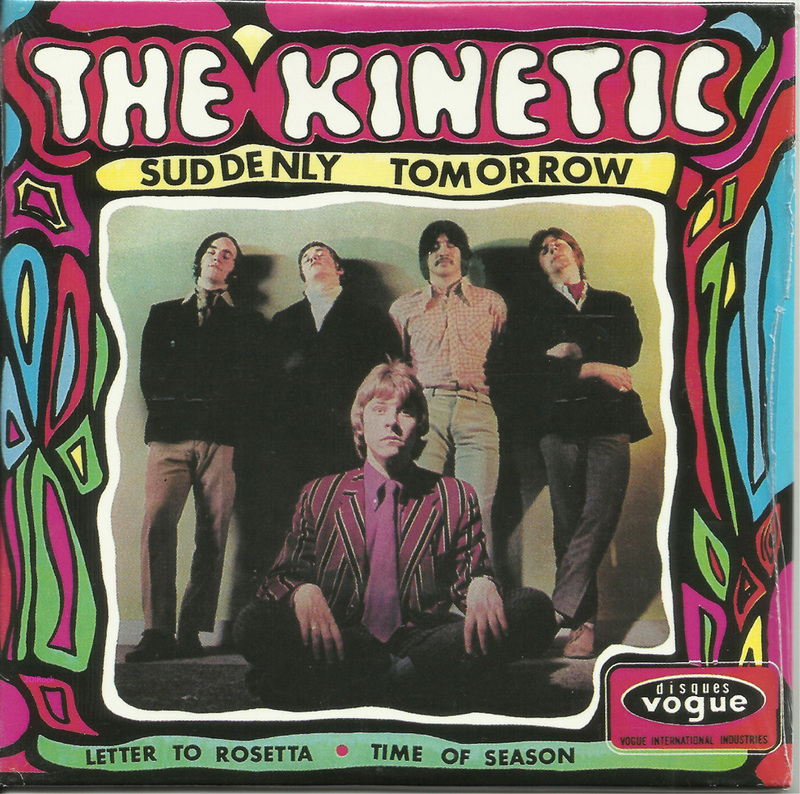 The Kinetic were Andy Mowbray (vocals), Bob Weston (lead guitar), Geoffrey Capper (bass), John Christopher Sze (drums), and Michael Humby (organ). They issued a 10 cut album for Disques Vogue, which is reproduced here, (all self-penned compositions) in 1967, seven of the cuts from which were issued as two EPs. Magic have already reissued these as CD EPs in original sleeves, so if you own those, you don't really need to go here as well. 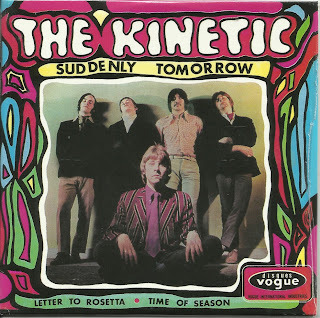 The Kinetic may be known to readers from their two contributions to compilations, 'The Train', a rollicking R'n'B blues-harp wailing instro and their standout track, the pop-siker 'Suddenly Tomorrow'. The latter title is indeed a cool sike moment featuring big chords, minor scales and a nice '67 feel. It stands head and shoulders above the rest of the album's contents. More generally, The Kinetic come across at times like a sub-Action. They certainly employ the crisp soul / pop-beat of the times in 'Live Your Life', 'Letter To Rosetta' and 'Sunny Cloud' (think Timebox, Zoot Money, The Cam-Pact etc). They also do a reasonable line in pop whimsy ('Child's Song') and acoustic led balladry (Hall of the Viking', 'Time Of Season' - no, not the Zombies!). Then there's the R'n'B of 'The Train' and 'Willy 'D' Fixer'. The last cut 'Jam Around' is exactly that a banal and mandatory (for the times) slow blues filler instro with interchangeable guitar and keys lead breaks. This album looks good, I'm going to D.L. it later today. I love the video you posted of it. You have the best blog on the internet.! This was an unusual band for it's day - having it's roots as a Swedish band called the "Cherry Stones"... After 1965, they worked their way through Europe, headed by Andy Mowbray, [who was English], and as Swedish members had to leave, they were replaced by British musicians - until by the time they morphed into "The Kinetic" in Paris, , the band was all English... Their recordings were not fully representative of their live performance style which was more dynamic - with a psychedelic/blues flavor. 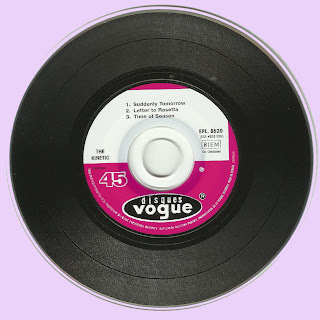 Their recordings were somewhat limited by the fact that the record company had requested that all songs be penned by the band themselves - something they did not normally do. The group's singer Andy Mowbray would later move to the USA, change his name to "Spanna Mo" and found a cult-band called "If"... Bob Weston, the virtuoso lead guitarist - would go on to play with other such notable performers as Long John Baldry, Elton John, Rod Stewart, Ashman Reynolds, and Fleetwood Mac.